D3 Sea Lodge - Umhlanga Rocks Accommodation. This luxury self catering duplex apartment consists of a lounge, dining area and a modern, fully fitted kitchen. There are three double bedrooms with a main en suite and two additional bathrooms. The apartment comfortably sleeps six people with a king size bed in the main bedroom and the 2nd bedroom and two single beds in the 3rd bedroom. Off the open plan lounge and dining area are sliding doors onto the patio and small garden. The main bedroom and the 2nd bedroom open out onto the joint upstairs patio with views of the sea. Three (3) double bedrooms with king size beds that can be reconfigured into single beds on request. Main en-suite bathroom and two (2) additional bathrooms. Washing machine, clothes dryer and dish washer. Alternatively, laundry and ironing can be done for you at a small additional cost. Quality linen and bath and swimming towels are provided. 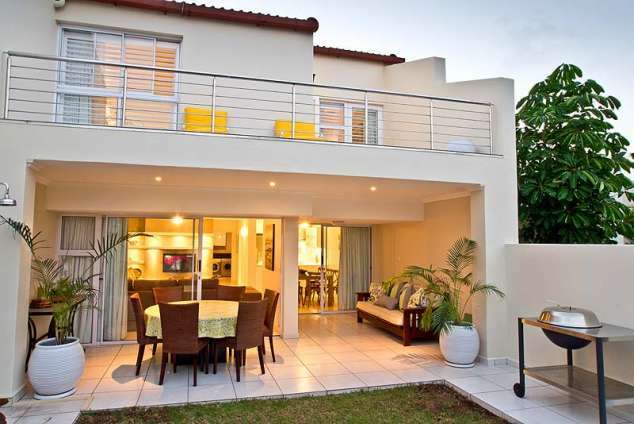 Sea Lodge is in easy walking distance of the Umhlanga Village. There are numerous hotels in the immediate vicinity where children can enjoy ten pin bowling, game arcades etc. There are several family and upmarket restaurants in easy walking distance of the apartment. Sea Lodge is so ideally situated, one can virtually park you car at the beginning of your holiday and have no need to use it again for your entire stay. Sea Lodge is a five minute drive from Gateway, (the largest shopping centre in the Southern Hemisphere) twenty minutes drive from Durban and the International Conference Centre (ICC). King Shaka International Airport is a fifteen minute drive from Umhlanga Rocks. There are several fine restaurants in the village or at Gateway Shopping Centre. A private first world hospital is a five minutes drive away by car. There are several world class golf courses in the immediate vicinity. Umhlanga Rocks is the most sought after holiday resorts on the East Coast of South Africa whilst retaining its unique seaside village appeal. Your stay at D3 SEA LODGE will be a pleasant memorable experience. 47832 page views since 19 Jun, 2012. Last updated on 12 Jun, 2018.